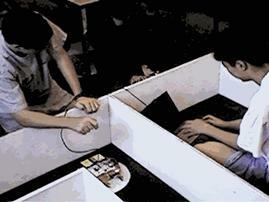 I have been experimenting with amateur robotics for a long time. 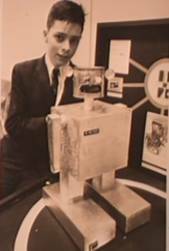 My first robot was named Rob Robot and was constructed in 1963 for an elementary school science fair. Rob looked like most of the science fiction robots of that time. I improved Rob the next year and won the local science fair. 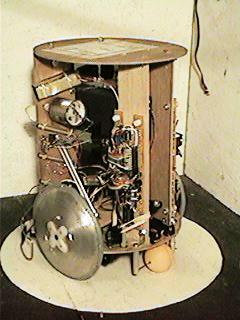 The idea for building Rob came from a construction article in the March 1962 issue of "Popular Electronics" on building Emily the robot. I improved Rob’s sensitivity by adding a second transistor to his circuit in a darlington pair arrangement. He could follow a white line on the floor or follow a light beam. Rob won third place in the state regional contest. I later learned that the judges thought my exhibit was the best one but they did not believe I had done all the work. Well at least I know it was the best. After the science fair Rob spent several years as a remote controlled high school basketball mascot. 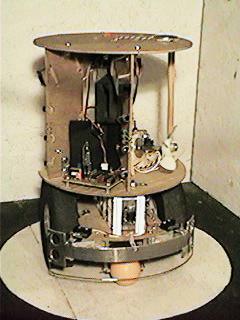 In 1987 Rob was modified to add a block catcher and a light detector. The catcher and light detector allowed him to compete in our next robotic club's annual contest. That year the robot had to find a white block in an eight by eight foot black robotic play pen and put the block in a six inch square hole under a light bulb. Rob was able to get one of the four blocks to the hole almost every time. The next robot built was named Jr. by my wife. It started out as an early HEP training kit with a Motorola 6800 microprocessor. First I modified it to drive two stepper motors. At first it was just programmed to wonder around and avoid objects using just a front bumper then a robotic hand and a remote control was added. The 6800 computer was modified to have 2k of memory instead of 128 bytes and four parallel ports were added. The goal of the new robot was to have all of its systems controlled by the computer with a remote control only giving the robot commands. The robot was finished in 1981 just before my daughter was born. It was a good thing that it was finished then because life as I knew it changed drastically. Jr. has a hand that opens, closes, rotates and lifts from the floor to the top of the robot. An attachment for the hand allows Jr. to launch paper airplanes. Another attachment allows him to hold a felt tip pen. A pen holder was also built into the center of the base of Jr. The pens are raised and lowered using the hand lift controls. His program has several modes of operation. In the first mode Jr. is operated using a remote radio link. All of his actions are controlled using a modified calculator that sends hexadecimal commands to the computer. The second mode is a numerical control mode where the hexadecimal commands are entered directly in memory and Jr. executes them in sequence when commanded by the remote to run a stored program. With one of the numerical control programs Jr. writes its name. There are looping commands and commands for how long or how far for the different actions. The last mode is a teach mode. In this mode Jr. remembers everything it does and saves the commands in the program storage area. Then Jr. can repeat the actions at the command of the remote control. Jr. has logged a lot of time visiting local schools, launching paper airplanes at coworkers and making a mandatory appearance at each of my daughter’s birthday parties. (Until she entered middle school) He still works and makes an appearance at Duke University TIP every time I teach there. My Duke TIP classes are described later in my robotics history. 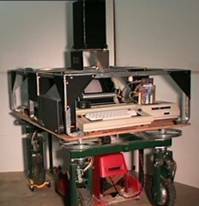 Then in January 1984 the local home brew computer club reorganized to become a computer experimenter and hobby robotics club. They reorganized because at that time it became less expensive to buy a computer then to build one your self. I attended the organizational meeting with Jr. This group (now called) Triangle Amateur Robotics is still active and still encourages me to continue working on my robotics projects. Check out the club history on the club’s web site. Well, back to the lawnmower. 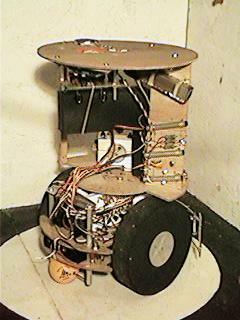 In 1983 one of my coworkers (Roy Miller) challenged me to build a useful robot that would mow grass. A task he hated to do. This intrigued me and again I started on another robot. For the first year all I did was talk with Roy about the robot during lunch. We discussed how to do the mowing, locomotion, navigation etc. The lawnmower was a very big project. It is presently in its third platform. The first one was a three wheeled unit with three wheel drive. That platform was unstable and flipped over too easy. The second had four wheel drive with four wheel steering. It had traction problems. Even though it had four wheel drive, uneven ground would lift two of the wheels off of the ground. The third platform (I call it the “Robotic Lawnmower Test Bed”) has four wheel drive and four wheel steering with the front two wheels attached to a bar on the front of the chassis that pivots to keep all four wheels on the ground like the front wheels on some riding mowers. The robot moves forward and backwards with its wheels pointing straight ahead. When it turns it stops and uses a single motor to turn all the wheels tangent to the center of the robot. Then the robot can rotate in place without changing location. I designed the steering this way to simplify navigation. I found a Toro 12 volt electric push lawnmower deck and incorporated it into the third platform. The deck saved a lot of time designing something to cut the grass. Work on this project was very slow. Typically I would work on it a couple of months each year just before the annual club contest. That is unless I was working on a robot to enter in the contest. At present the lawnmower is controlled by a Radio Shack Color Computer. 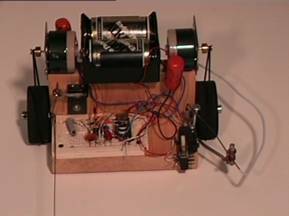 An interface was built to drive the four drive motors and the steering motor. One of the drive motors has an encoder to determine how far the robot turns or moves. I designed/built an inverter to provide 120 volt ac to the computer and its disk drive. Most of the work up to this point went fairly fast. Two to three years. Then there was the problem of navigation. I was determined to make the robot self guiding. That meant that the robot has to know where it is and be able to plan the route to take to mow the grass. After several years of experimenting with lasers and beacons a transit was designed for the robot in 1992. The transit turns around and locates infrared beacons that have emitters on the top and bottom of tall poles. The emitters on each pole send out a 40kH signal. Each pole identifies itself by modulating the 40kH signal on and off at different frequencies. The computer turns the transit until it sees the top of one of the beacons to determine its direction from the robot then the computer turns the detector down until it sees the emitters on the bottom of the beacon using the angle moved to calculate the distance to the beacon. The present transit is not accurate enough to do the navigation for mowing. In the future an RF modem is planned and possibly a complete redesign of the chassis (It is too big.). All of the navigation problems could be solved with a differential GPS system but that is too expensive. The on board computer needs to be upgraded. The 64k Color Computer does not have the trig functions or the accuracy needed for the navigation calculations. Or the navigation and route planning could be done by a remote computer and commands transmitted to the mower. This mower project was never planned to be a product. Just a challenge and learning experience. Then there are the club contests to build robots for. 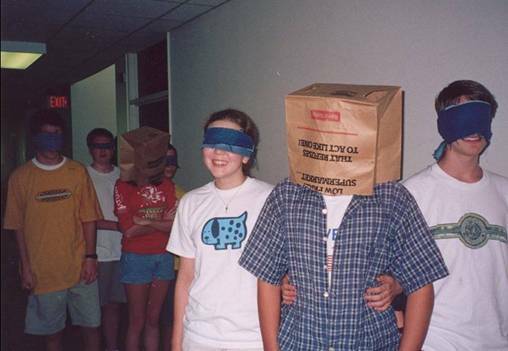 In 1987 the Robotics Club (TAR) decided to do a club contest and I came up with the Vision Contest. The contest arena was eight foot square with one foot high walls and everything painted flat black inside. 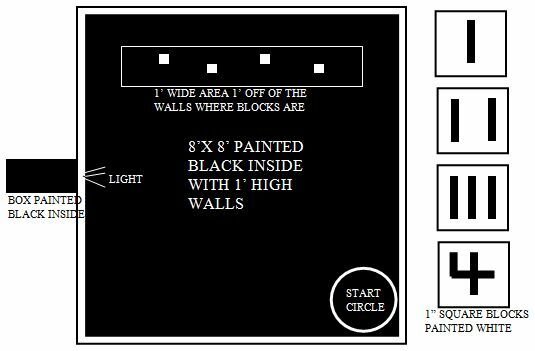 Four numbered white blocks were placed in a one foot wide area that was one foot from the walls opposite the start circle. The blocks were randomly placed in the block area with the numbered side up and had to be at least one foot apart. 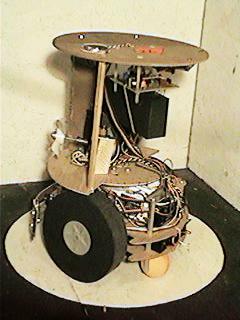 The robot was placed by the contestant in the start circle. The first level of the competition was based on how long it took to get one block through a four inch square opening in one of the walls. The bottom of the opening was the floor, there was a bright white light just above the opening and a box painted flat black inside behind the opening to prevent light from coming out of the opening. The second level included putting all four blocks through the opening in the least time and the final level included putting all four blocks through the opening in numerical order in the least time. Notice that the blocks are numbered such a reflective sensor in each corner of the block and one in the center could determine the blocks number. The contest ran for several years and only the first two levels were reached. I think that this is still a good club contest to run now. 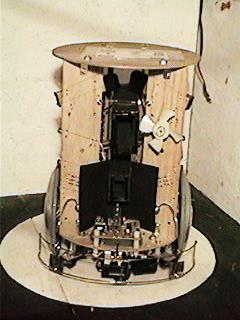 In 1987 I built a tele-operated robot to evaluate using a video camera to locate the blocks in the club vision contest. A Radio Shack “Iron Claw” remote control toy was gutted and hard wired to a remote control panel. An old surveillance camera was attached to the top of the robot. The robot was operated remotely while the operator looks at a video monitor. It is quite educational to operate the robot seeing what the robot sees and try to locate blocks, pick them up and put then in a small opening. I determined that it took too much computing power (in 1987) to use the video camera to find the blocks, navigate and determine the block number. However, the robot has seen a lot of action with people operating it at various club functions. For the years we ran the vision contest we let visitors compete against each other using the robot to perform the contest. 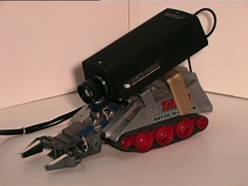 This robot has outfitted with a new lighter video camera in January 1997. The picture has the old surveillance camera. The new camera just needs a single small cable to provide power and carry the video. This was quite and improvement over dragging a coax cable and a grounded drop cord. The robot was upgraded so it could be used by Explorer Post 2350 at a Boy Scout Mall Expo. 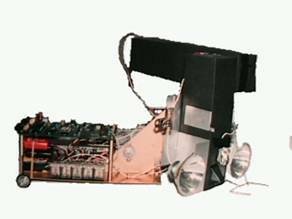 In 1988 an old Radio Shack remote control tank was converted into a test bed for evaluating sensors for the vision contest. Using the Light Tank I developed a differential light detector that uses two light sensors connected in a half bridge circuit. The detector ignores changes in ambient light (like someone turning on a video camera light) but detects edges of sudden light change (such as the side of a light bulb or the edge of a white block). 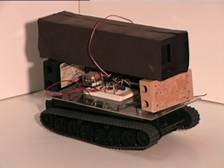 The first time this detector was demonstrated at our robotics club the light tank immediately charged the president of the club and started chasing him around. He was wearing black pants and the room had white walls. The detector can spot a flashlight at 30 feet and a white block in a dark area at 6 feet. One of the secrets of the detector is the light trap that reduces the stray light entering the trap. The patricians inside the trap capture the stray light. The trap is made out of flat black construction paper. 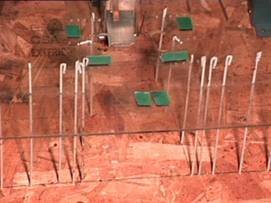 The Atom Ant robot described below uses two of these detectors. 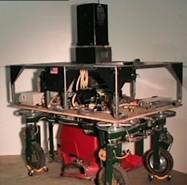 In 1988 another contest robot was designed for the block finding vision contest. It was named "Atom Ant" because it looked like it had two big eyes. Are you old enough to remember the Atom Ant cartoons with the ant wearing the big glasses? 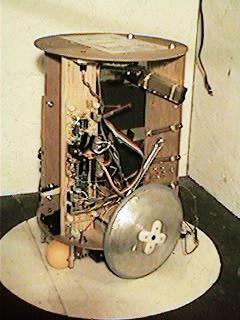 This robot was built at the last moment and used a Motorola 68HC11 single board computer. I had the computer at home to learn how to program in assembler for a project we were doing at work. The example programs were boring so I bolted the computer to some wheels and a couple of motors and it was a lot more fun to learn to program something that moves. Then just a couple of weeks before the contest I realized that this platform might be able to do the second level of the vision contest. In the second level you had to collect all four blocks and put them through the opening. The robot has one drive motor and one steering motor. Two light detectors are attached to the drive motor portion of the robot so they turn with the drive wheel. One vertically oriented light detector with a 45 degree mirror looked for the blocks and the horizontally oriented detector (on top) looked for the light above the wall opening. These light detectors were developed using the Light Tank described above. There are two other sensor inputs. One detects a block in the block catcher and the other detects the wall when the robot enters the opening. Atom Ant was able to do the second level of the contest by locating one block at a time. Capturing it in the wire block catcher and pushing it into the opening. Navigation is simple. Point the robot to the right of the first block. The robot starts steering the detectors left looking for a block. When a block is seen turn on the drive motor. With the drive motor going steer right until the block is not seen then left until the block is seen. The robot steers its head back and forth as it advances. When the robot runs into the block it then starts looking for the light above the opening and repeats the same behavior as when it is looking for a block. When it runs into the wall it backs up and starts looking for another block. After the fourth block is inside the opening the robot backs out and stops. Well Atom Ant was able to get all four blocks in the opening a couple of times during the contest. In 1988 and 89 a robot was built to put eye drops in our dog Susie’s eyes. Susie’s tear glands were damaged due to an eye infection and the vet wanted us to put drops in her eyes every couple of hours during the day. Well that is hard to do when both you and your wife are away at work 9 to 10 hours a day. I thought it should be easy to put eye drops in a dog's eyes with a robot. The first problem was Susie hated to have the drops put in her eyes. This was solved with a dog biscuit reward after each application. First a dog biscuit dispenser was designed. The dispenser was operated with an old Radio Shack Color Computer. The computer sounded a tone then pushes a dog biscuit out of the dispenser just a little bit. When the dog tried to get the biscuit out of the dispenser her nose touches a micro switch. The micro switch lets the computer know the dog is there and ejects the dog biscuit all the way out. For a while the computer would sound the tone every couple of hours and we would go over and put eye drops in and let the dog get the dog biscuit. Next a frame was built to hold the dog biscuit dispenser up high on a slanted surface. When Susie was standing on her tip toes the surface lifted her head up at a 45 degree angle as she reaches for the dog biscuit. After the dog became accustomed to the frame a Plexiglas top was mounted on top of the frame that wedged Susie’s head down when she reached for a dog biscuit. As the dog became accustomed to the Plexiglas top pins were added to the sides to guide her head and noise. Slowly more pins were added until the Susie had to wedge her head into the fixture to be able to get the dog biscuit. Two small holes were drilled in the Plexiglas cover right over the location of her eyes as she was wedged into the fixture. An eye drop dispenser was then designed that squeezed two eye drop bottles. Finally the whole thing worked. The system waited for two hours, sounded a tone then presents the dog biscuit part of the way out. When Susie squeezed her head in the fixture and bites at the dog biscuit her nose touches the micro switch. The eye drop bottles were squeezed releasing the eye drops in the her eyes then the dog biscuit was pushed the rest of the way out. It actually worked. The vet was real excited and was setting up a visit for me with the vet school. Then it happened. A scientific breakthrough! A new eye drop came on the market that lasted 12 hours. Well it was a terrific educational experience and Susie was fat and happy while I was working on the project. Starting in 1980 for many years members of the Triangle Amateur Robotics Club (TAR) gave robotic presentations for the local Parents for the Advancement of Gifted Education (PAGE) Saturday morning program in the area. This PAGE program was developed by a group of Raleigh NC parents that wanted their gifted children doing something better than watching TV on Saturday mornings. In the early days we demonstrated our robots to the class and talked about robotics. The students enjoyed the demonstrations, but it was hard to keep the gifted student's attention when we talked. We thought the class would be better if each student actually built a robot they could take home when the class was over. 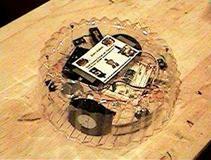 We developed a wire remote control robot called the TAR Rat (Rat). 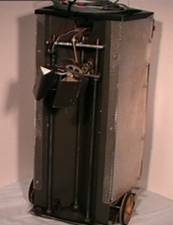 The Rat basically was a wooden base with two wheels, a couple of motors and a battery pack that is attached with wires to a box with two switches. The students enjoyed making the Rats and over 100 of them where built in the classes. After completing the Rats the students put their Rat's through several exercises where they simulated robotic tasks. The Rats went through several design iterations. 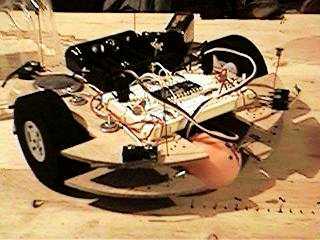 The last version of the wire controlled TAR Rat is pictured on the right. Because the TAR Rats took too much out of class preparation time the Organic Robot Presentation was developed. The Organic Robot is a simple hands-on classroom presentation that lets students design, program and build a simple robot in the classroom. The presentation can be performed without tools or expensive robot kits. The Organic Robot was originally developed for amateur robotics hobbyist to use to teach robotics to gifted elementary school students. Since the presentation was developed it has also been used with middle and high school students, FIRST teams, Boy Scouts and adults. Practically any technically oriented teacher/volunteer can learn to give the Organic Robot presentation. The presentation can be performed in two to three hours or used as the introduction of an entire unit on robotics. Only a few simple props and a black board are needed. Instead of using an expensive robot (that the whole class has to share) the presentation actually lets the students brainstorm to design the robot and brainstorm to develop a robotic programming language. After the robot is designed and the programming language is developed the students flow chart a program for the robot using their programming language. All of the design, development and programming are performed on a black board. The robot is constructed out of organic parts (the students). Then the robot executes the flow charted program. Down load the complete Organic Robot Presentation lesson plan. A condensed version of this lesson plan was a feature article in the March, 2001 issue of Circuit Cellar magazine. 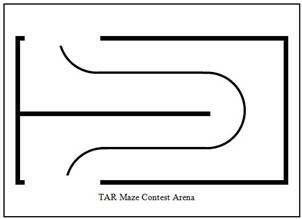 The next TAR Club contest was a simple maze contest. The walls were a little less than a foot high painted white. The floor was painted white with a black line through the maze with a one foot wide path between the walls. Again at the last moment I designed a robot for the contest. I added a micro switch to a TAR Rat. The micro switch was attached to a wire that would touch the wall beside the robot. When the wire touched the wall the motor on the wall side turned on turning the robot away from the wall. When the wire left the wall the motor on the side opposite the wall turned on turning the robot back toward the wall. This arrangement causes the robot to wobble back and forth going along the wall. This arrangement works great going around a wall but the robot would drive directly into the wall in front of it at a ninety degree turn. Next I added another micro switch and a wire that looked like a lance sticking out in front of the robot. This lance like bumper hits the wall in front of the robot in time for it to turn. The lance pushes the micro switch when the wall is reached. The micro switch triggers a 555 timer circuit that is set for enough time for the robot to turn ninety degrees. The 555 timer circuit closes a relay that disables the motor opposite the wall and powers the motor next to the wall. At the end of the set time the relay opens returning the robot to its normal wall following wobble. This Robot (that I call Maze Rat) dependability goes through mazes. It is a big hit at school presentations and fellow robot experimenters can’t believe how simple it is. This is a case where the robot came before the contest. For years I had been giving robot presentations at schools, PAGE or Boy Scouts and always somewhere in the presentation I would say that one day I am going to build a walking robot. I had many drawings on napkins, notebooks and scraps of paper but nothing seemed simple enough to attempt to make back then. I kept thinking about those wind up toys that walked using two U shaped feet that basically stepped over each other. I kept trying to figure out how to make the feet so the robot could turn while standing on one leg without stepping on itself or falling over because its center of gravity fell outside of the U shaped foot. I did not want to make the robot turn like old people shuffling around from one foot to the other. It was Friday night and I was giving a presentation on robot locomotion to the robotics club Monday where I knew I would again be embarrassed to say again that one day I was going to build a walking robot. I decided to go to the basement workshop and think about the walking problem again. I like to visualize what I am doing so I grabbed my old Erector set and started laying out U shaped assemblies. Then eureka, discovery, light bulb flashing moment happened. I realized how a robot could walk and turn without stepping on its feet. One foot could be a large elongated 0 and the other foot could be a smaller circle that could fit/move forward and backwards inside the 0. When the robot stood up on the inner circular foot it would lift the outer foot off the floor so the robot could freely turn without stepping on its other foot. To move forward it would move the outer foot forward while it stood on the inner foot. Then the inner foot would lift lowering the outer foot. 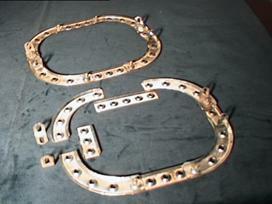 Once the weight of the robot was on the outer foot the inner foot would move to the front of the elongated 0. Then the inner foot would lower lifting the outer foot and repeat the process pushing the outer foot forward again. I quickly assembled the robot out of the Erector set parts and used double sided tape to attach three RC servos, a battery and RC receiver. The yellow inner foot is an Erector Radar/Communications dish. The outer 0 is made up of the larger Erector quarter circle pieces with straight pieces to elongate and widen the 0. 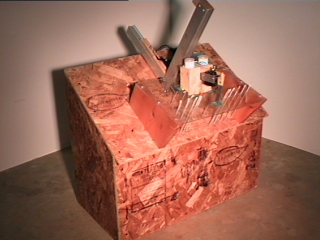 Most of the heavy items (batteries, servos and electronics) were connected to a red cube made from square Erector pieces. The red cube is attached to the outer foot by two Erector axels that go through the cube allowing the cube to slide forward and backwards inside of the outer foot. One forward backwards servo is attached between the cube and the outer foot (on the fourth photograph it is on the right/back side of the red cube). 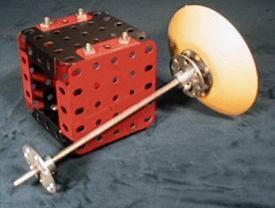 The inner foot is mounted on an axel that goes vertically through the center of the red cube. 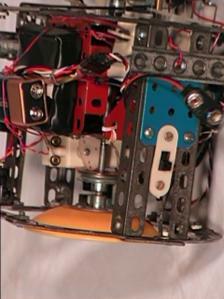 The outer foot lift servo/lower foot push down servo is seen in the fifth photograph attached below the red cube. A circular servo arm is seen that has been modified to be a cam that pushes down on an Erector pulley. 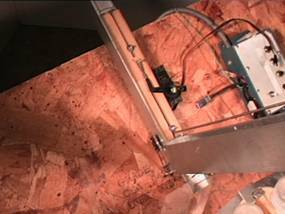 The back unmodified side of the servo arm cam rests against the red cube so all of the robot’s weight is on the cam instead of the servo. In the photograph the cam is in the inner foot down/outer foot up position. Notice that the inner foot is below the outer foot. 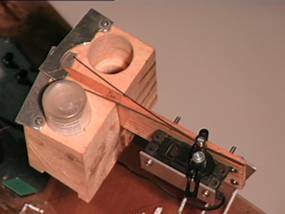 The turn servo is attached to the front side of the red cube. 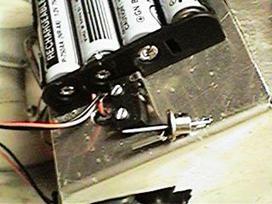 The servo’s arm is connects to an Erector hub attached to the top of the vertical inner foot. This hub is turned by the servo which turns the inner foot which turns the robot when the robot is supported by the inner foot. Between the hub and the top of the red cube is a spring that lifts up the inner foot when the cam rises. I connected the servos with the lift servo the RC plane throttle position, the front back on the elevator position and the turn on the aileron position. That seemed to make since at the time. I was definitely not coordinated enough to easily make the robot walk. Shortly after getting it going one of the servos failed and I had to dismantle the robot to replace it. When it was reassembled the servo connections were accidently changed putting the lift and front back servos on the elevator and aileron positions. To my amazement with this new servo arrangement all I had to do was move the elevator/aileron control stick in clockwise circles to make the robot walk forward and counter clockwise to make it walk backwards. At the club meeting that Monday evening the robot locomotion presentation was well received. However at the end of the presentation where in the past I would have to say “One of these days I am going to build a walking robot” I pulled out my new walker and said one of these days I will make the Stomp Walker a robot. This is another contest that I came up with. The contest is intended to run unattended for long periods of time in public areas such as schools, science museums, malls, hobby shop windows or at events like conferences and HAMfests. There are several reasons for a long duration public contest. The most important reason is the new members a robotic club can find with a along running public activity. Other benefits include encouraging young robotics and the development of very simple life like robots that are inexpensive and very durable. The object of the contest is to build walking robots that can survive for extended periods of time without human intervention. This is a friendly contest where the objectives are for the survival of all and not winning by eliminating the competition. To survive the robots must be able to wander around the contest environment interacting with what they encounter. They must avoid falling off of the edge of the environment and be able to maneuver around obstacles and other robots. Periodically each robot will need to locate the recharging station and recharge itself. The contest environment can vary in size. The size can vary from a three foot diameter circle up to a 3 x 8 foot area. The floor of the environment will be a flat non-conductive dark surface such as plywood, chipboard or Formica. There are no walls around the environment/floor area. The outside edge of the environment is the edge of the environment floor material. This edge will be cut perpendicular to the top of the environment floor and there will be at least a 2" drop off of the edge. White tape will be located a minimum of 2" from the edge. The tape will be at least 1/2" wide. The charging station will be located in the center of the three foot diameter area or no closer than 13 inches from any edge on the larger environments. The charging station will be located near the center of the contest environment. The top of the station is a 10 inch diameter aluminum disk. The disk is parallel to the floor and seven inches above it. This top disk will be the positive 12 volt terminal of the charging station. The disk will be attached to the lower portion of the charging station by a two inch diameter one inch long white tube. This white tube is attached to a four inch diameter six inch long tube that makes up the base of the charging station. The sides of the 2 inch diameter tube are illuminated by three IR LEDs modulated at 40 kHz. 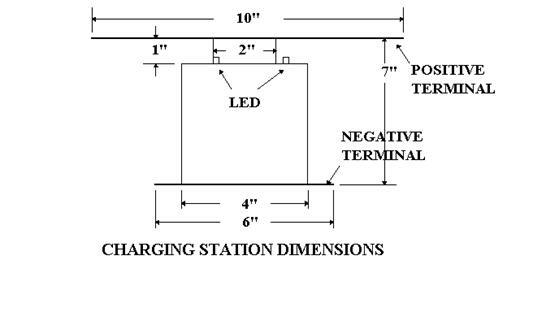 The base of the charging station rests on the negative terminal of the charging station. The negative terminal is a six inch diameter aluminum disk. (The charging station would work better if the negative disk is eight inches.) This negative disk is less than 1/16" thick and lays flat on the environment floor. The contest's duration will be determined before the start. It is recommended that the contest run for at least a week. However contests at events like HAMfests will run the length of the event. The winning robot will be the last robot wandering around. If there is more than one robot wandering around at the end of the contest time the winner will be the robot with the highest style points. The robots can receive up to 10 style points for each of the features/behaviors below. A simple/rugged feature implementation may score higher than a high tech one. Yes, part of the reason I designed the “How Long Can You Stomp” club contest was because I now had a walking chassis plus there seemed to be a lot of excitement in the club about walkers. This was about the time that Parallax introduced the BASIC Stamp single board computer. This computer is now called the BASIC Stamp I. The Stamp board was fairly expensive at first and one of the Robot Club members developed a kit for the computer that used a preprogrammed microprocessor chip from Parallax. I built one of the kits and attached it to the Stomp Walker. I had to use all of the Stamp’s 90 program memory spaces for the program. Down load the program for the Basic Stomp. The program can be opened with note pad but the Parallax BASIC Stamp editor works better. The Stomp Walker pictures above is actually pictures of the BASIC Stomp updated robot. In the first picture you can see the computer kit and the attached battery charging circuits on the side of the cube, micro switch floor sensors on the bottom front and the light trap for the IR detector on top. The robot starts out looking for the charging station by standing up on the inner foot and slowly turning while looking for the charging station’s IR emitters. If the emitters are seen the robot starts walking forward until the robot runs into the charging station. Once the battery charging circuits indicate fully charged batteries the robot starts wondering around. If the emitters are not seen the center foot rises, turns all the way in the opposite direction while raised, lowers again to lift the robot then starts slowly turning again. If the front of the robot steps over the edge of the table one of the floor sensors drops down releasing a micro switch. The program checks the floor sensors every time the outer foot lowers. Then the robot backs up, turns then continues going forward. The robot slowly changes speed to as an eight bit timer increases. When the timer overflows the robot suddenly walks faster. After a while the charging circuit detects low battery voltage and the robot starts looking for the charging station. There is also a micro switch in front of the robot that detects objects in front of the robot so it can avoid obstacles. The robot still works and is always an attention getter at presentations. Triangle Amateur Robotics (TAR) Club members built a mock up of the Mars rover in the Ken's Robots workshop. The replica is used at the club's robot exhibits/fairs and to take to local schools. It was a very big, very interesting and successful project. It is also the first major robot the club built together. The TAR Rover is a full size remote control mock up of the first rover on mars. Since NASA did not release dimensioned drawings of the rover in time to build it before it landed we scaled our rover using photographs and drawings found on the Internet of the actual rover. Our rover has six wheel drive, 4 wheel steering (like the real one) and a video camera/transmitter. It uses a BASIC Stamp 2 to control the ten RC servos used to make the rover move. Six servos are for driving the wheels and four are used for steering. The rover was built very light weight so we could use inexpensive standard size RC servos. The rover has five modes of operation: stop, forward, backwards, rotate clockwise and rotate counter clockwise. The BASIC Stamp 2 monitors two RC channels from the receiver and gives the proper signals to each of the 10 servos based on the commanded mode of operation. The rover’s speed varies with control stick deflection. We had hoped to be able to program the Stamp 2 to simulate a delay as if we are operating it over a great distance. However the Stamp has to do too much. One of the improvements we are planning is to add another Stamp or PIC processor to simulate a control delay. Another improvement would be to add proportional gentle turns (without stopping) while going forward/backwards. Down load the program for the TAR Rover. 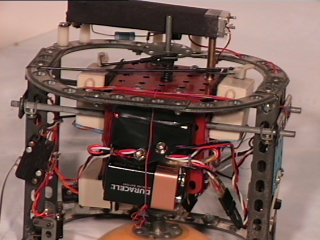 A small color CCD camera is mounted in the front of the Rover and a Rabbit video transmitter is used for the RF link. Lord Corporation's Controllable Materials division provided the funding to purchase the servos, computer and radio control equipment. 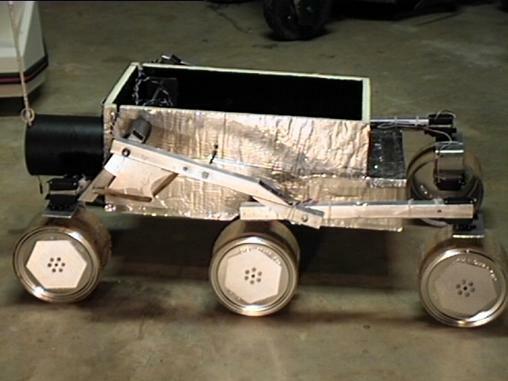 The rover was constructed in the Ken's Robots basement workshop by a team of eight TAR members over a 6 week period. There are now two TAR Rovers. Two students, Hannah Randall and Brett Elko from the North Carolina School of Science and Mathematics made a copy of the TAR Rover. The students built the rover as part of a special program with the North Carolina State University Mars Mission Center. The students met twice a week for 3 hours in the NCSU labs. Niep a graduate student was their advisor and Ken Boone from Lord Corporation loaned the original to NCSU for the semester and provided technical information and help. Both Niep and Ken are TAR Club members. Yes that is a HERO 2000 in the background in the TAR Rover pictures. The Organic Robot Trainer was first developed to demonstrate the flow-charted program the students wrote during the Organic Robot Presentation described above on an actual robot. 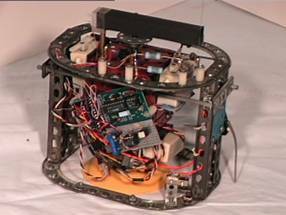 The robot's design was revised several times to make it easier to assemble and is now used with the Duke University TIP program. The pictures are the first version of the Trainer. It is now outfitted with a large plastic spider cover and was used in a Halloween Haunted House several times. 2005 was the 6th year I taught a robotics class for the Duke University Talent Identification Program (TIP). The classes run for 3 weeks with the students in class 6 days a week for 7 hours a day (3 hours on Saturdays). During the first week and a half the students are taught how to build amateur robots from scratch by building a robot of their own. During this introduction period each student builds a copy of the robot that I designed for the course. With a combination of instruction and learning by doing the students learn how to read mechanical drawings and schematics, use simple tools, and do mechanical layout, sawing, drilling, soldering, wiring and programming. During the last week and a half of the course the students are divided into four teams and each team builds a fire fighting robot using the box of identical materials given to each team. The classes have been a great success and everyone had a great time. Thanks for the help of Bob Hamlin who helps teach the course and Nancy Womack (98 class), Kevin McGowan (99 class), Lori Webber (2000 class), Dennis Chin (2001 class), Dana Scott (2003 class) and William Cox (2005 class) college student teaching assistants. 1999 was my first year attending the International Fire Fighting Contest. I was thrilled when my robot "KensRobot" placed 8th in the senior division. The robot used two Parallax Inc. Basic Stamp II computers networked together for control. Its sensors included two homebrew IR range sensors, two line sensors, two Hamamatsu Corp. UVtron flame sensors, a Precision Navigation Inc. Vector 2X digital compass, two bumper sensors, and a sound sensor. It used two Hitec RCD Inc. RC servos converted for continuous rotation to drive the wheels and a RC servo to turn the sensor head. A fan was used to extinguish the flame. The robot ran in the non dead reckoning mode and was able to return to the starting circle most of the time. My robot "KensRobot 2000" was similar to the previous year's robot. 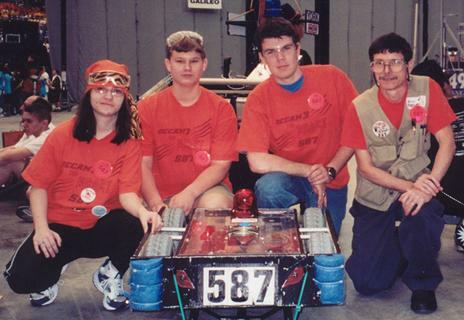 It placed 13th at the 2000 contest with a score that was eight times better than the previous year's robot. There was more competition at the 2000 contest with a lot of outstanding robots participating. The robot used one Basic Stamp II and two Basic Stamp SX Parallax Inc. computers. All three computers where networked together. One of the SX computers was connected to three homebrew IR range sensors and two bumpers. This computer accepted commands like "Follow_Right_Wall" or "Forward_to_Wall." The Stamp II did the signal conditioning for the Hamamatsu Corp. UVtron room flame detector. It also measured the frequency of the sound sensor circuit to determine when to start and it operated a Precision Navigation Inc. Vector 2X digital compass. This computer accepted commands like "Turn_North" or "Turn_South_West". The second SX computer was the master. It sent commands to the other two computers and it monitored the homebrew candle light detector, two Sharp GP2D05 IR detectors (used to detect the candleholder) and a floor line sensor circuit. The master computer also controlled the fan. All three computers controlled the two Hitec RCD Inc. converted drive servos using a Scott Edwards Electronics, Inc. Mini SSC II serial servo controller. This robot also ran in the non dead reckoning mode and was able to return to the starting circle all of the time. 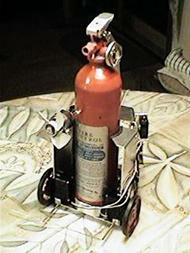 The modified "KensRobot 2000" placed third in the senior division at the 2001 International Fire Fighting Contest with a score that was six times better than the previous year's 13th place score. The robot uses one Basic Stamp II and three Basic Stamp SX Parallax Inc. computers. Three of the Stamps are networked together and one Stamp operates the three high-speed homebrew IR range sensors. The networked locomotion, navigation and sensor Stamps all communicate with each other over a 5 bit parallel buss and one handshake line. The locomotion computer uses the range information form the IR computer and accepts commands like "Follow_Right_Wall" or "Forward_to_Wall" from the navigation computer. The sensor Stamp does the signal conditioning for the Hamamatsu Corp. UVtron room flame detector. It also measures the frequency of the sound sensor circuit to determine when to start and it operates a Precision Navigation Inc. Vector 2X digital compass. The sensor computer accepts commands like "Turn_North" or "Turned_South". The navigation Stamp is the master. It sends commands to the locomotion and sensor Stamps and it monitors the homebrew candle light detector, two Sharp GP2D05 IR detectors (used to detect the candleholder) and a floor line sensor circuit. The navigation computer also controls the fan. The locomotion, navigation and sensor Stamps share one pin on each Stamp to control a Scott Edwards Electronics, Inc. Mini SSC II serial servo controller. The controller is used for the two Hitec RCD Inc. RC servos drive servos using a Scott Edwards Electronics, Inc. Mini SSC II serial servo controller. This robot also ran in the non dead reckoning mode and was able to return to the starting room in the arbitrary starting point mode all of the time. 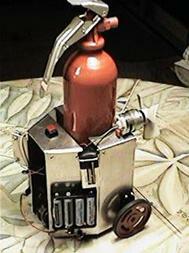 The modified KensRobot placed third in the Expert Division at the 2003 International Fire Fighting Contest. I modified my 1999 contest robot for the new Expert division rules. The robot used two Parallax Inc. Basic Stamp II computers networked together for control. Its sensors included two homebrew and one Sharp IR range sensors, two line sensors, two Hamamatsu Corp. UVtron flame sensors, two bumper sensors, and a sound sensor. It used two improved Hitec RCD Inc. RC high-speed metal gear servos converted for continuous rotation to drive the wheels and a RC servo to turn the sensor head. A fan was used to extinguish the flame. The International Fire Fighting Contest is a great event. It is very exciting to be at one place with hundreds of people that want to talk robots, attend great seminars and actually talk to some of the legends of the amateur robotics community. Since 2003 I have been giving seminars at the contest and have been a member of the contests technical advisory board. I hope to see you there at the next contest. Jake Mendelson started the Fire Fighting contest and mentioned to me that the tenth year would be his last year. One of my home fire extinguishers lost its charge and I decided it would make a great trophy commutating Jake’s ten year involvement in the contest. I sketched up a design using the fire extinguisher as part of a working fire fighting robot and contacted a friend of mine that worked at Acroname Inc. http://www.acroname.com/ They are a company that sales lots of great robotics parts and kits and had sponsored part of the Fire Fighting contest for years. For the trophy/robot Acroname provided one of their computers, drive servos, wheels and a range sensor. The robot was completed in time and presented to Jake at the tenth anniversary contest. One problem with lots of robots is they don’t have bumpers or the bumpers are not designed well and break. Jake’s Robot uses one of my favorite methods of installing dependable/strong bumpers. What I like to do is use a piece of tubing to limit the amount of travel the bumper has to activate a micro switch. 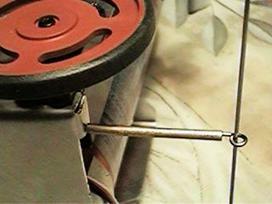 The lever on a micro switch is very fragile and easily broken if it has any side force on it. Check how the tubing in front limits backward travel and how the micro switch is mounted. FIRST Robotics: I was one of the mentors for team 587 from Orange County North Carolina for the 2001, 2002 and 2003 competitions. In 2003 our FIRST team did great at the nationals. At the nationals they were fourth in their division (all of the teams were divided into four divisions.) For all of the 291 teams that qualified for the nationals the team posted the third highest score for a single match and ended up with the 18 highest average rounds score points. Average point's ranked the teams. The team was invited to the nationals because it did so well at the Richmond regional. At Richmond the team was in 6th place at the end of the qualification rounds. Our alliance lost in the final elimination round due to weak batteries and the alliance ended up the semi-finalist alliance (second place alliance). The team also won the General Motors design award. This was one of the first years where the robots ran in the autonomous mode and the team’s robot worked great. It was always the first robot up the ramp knocking down most of the bins except that last low battery run. I had a medical close call a while back and while recuperating I saw the movie Bucket List. One thing I have been thinking about for years is what it would take to combine my Radio Control Model Airplane, HAM Radio and Amateur Robotics hobbies to make an Unmanned Aerial Vehicle (UAV) from scratch. Make a plane that can take off, fly a pattern and land without any outside control input. So far I have made some progress with the airframe. The first prototype is shown. The missing bite out of the front of the wing was due to a close encounter with a power line. When you are used to flying a small thirty two inch model flying a much larger one seems to be a lot closer than it actually is. The plane is made entirely out of packing tape and Z-Foam foundation insulation. The first prototype proves the basic construction technique and power plant. 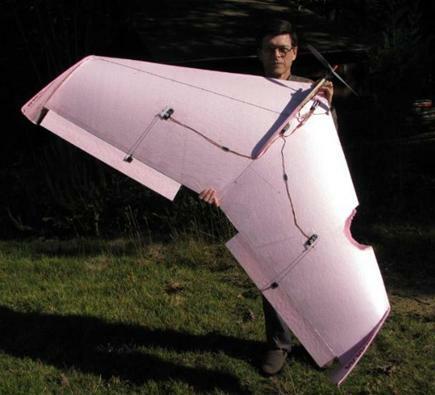 A more efficient higher lift airfoil is planned for the next version. I get a lot of e-mail asking where to get information on building amateur robots. I enjoy getting the messages and please keep sending them. But I thought I would add a resource section to this page. The following are good resources that I have found. "The Robot Builder's Bonanza: 99 Inexpensive Robotics Projects" by Gordon McComb, publisher TAB Books Inc No, 2800 ISBN 0-8306-0800-2 This is a very good beginners book with a large reference list appendix. It is also a must for the experienced builder's library. "Nuts & Volts Magazine" 430 Princeland Ct., Corona CA 91719, http://www.nutsvolts.com/ Good parts and kit resource and it has a regular robotics article and several robotic projects each year. "ROBOT Science & Technology" magazine, 888 510-7728 http://www.robotmag.com This is one of two amateur robotics magazines I know of. "ROBOTICS Digest" magazine 719 254-4558, email 102505@compuserve.com This is one of two amateur robotics magazines I know of. "CIRCUIT CELLAR INK" magazine 800 269-6301, http://www.circuitcellar.com Good electronics magazine for people that like to build things. They have several good robotics articles a year. Mondo-tronics Inc., 524 San Anselmo Ave 107-11, San Anselmo CA 94960 (415) 455-9330 e-mail info@mondo.com http://www.robotstore.com is their web page. They where the first robot store and they have the only amateur robot catalog I know of. Lots of kits, books and neat stuff. KELVIN, 10 Hub Drive, Melville, NY 11747, 800 535-8469, http://www.kelvin.com/ Good parts resource. They have supplies for school science classes. "Mobile Robots: Inspiration to Implementation", By Anita Flynn and Joseph Jones, publisher AK Peters, Ltd. This is a good book for the serious robot builder. It goes through the steps on how to build two computer controlled robots. Order form AK Peters below. AK Peters, Ltd. 508 655-9933, http://www.akpeters.com/ Publisher they have several of the best amateur robotics books and they sale the RugWarrior robot. http://www.frc.ri.cmu.edu/robotics-faq is a great web page for robotics frequently asked questions. Marlin P. Jones Associates, PO Box 12685, Lake Park, Florida 33403, 800 652-6733, http://www.mpja.com, Good parts and kit resource. Edmund Scientific, http://www.edsci.com They have optical supplies and science supplies. Wirz Electronics, http://www.wirz.com/ PIC stuff. Parallax Inc., http://www.parallaxinc.com Basic Stamp computers, serial displays, robot kits and other neat stuff. Scott Edwards Electronics, Inc. 520 459-0623 http://www.seetron.com Neat displays and stuff for micros. Acroname Inc. 303 258-3161, http://www.acroname.com/ Robotic sensors, books and robot kits. Hobby Masters 919 870-1121, http://www.hobby-masters.com/ Excellent local hobby shop in Raleigh NC. Gives discounts to students and teachers doing robotic projects. Robot Books, http://www.robotbooks.com/ They have a neat web page and they sale robot kits, books and robot toys. GoRobotics.net, http://www.GoRobotics.net/ and RobotGeeks.com, http://www.RobotGeeks.com/ two great web pages by a member of our robot club. MrRobot, http://www.mrrobot.com/ They have a neat web page and they sale robot kits, robot parts, books, compilers and microcontrollers. H & R 800 848-8001, http://www.herbach.com/ A good source for surplus equipment, motors and sensors. MCM Electronics 800 765-6960, http://www.mcmelectronics.com/ A good source for electronic and VCR parts, and timing belts. Jameco Electronics 800 831-4242, http://www.jameco.com/ A good source for electronic components, microcontroller chips, robotic sensors, electronic compass and electronic kits. I will keep adding more as I have time and find good ones. The information in this web page is the intellectual property of Kenneth Ray Boone. Do not copy or use any of the contents without the permission of Kenneth Ray Boone. Please do not copy this page. It is under construction and copies can not be corrected. If you like the page send me a message to let me know, add links to this page in your web site and give the address to other hobbyist. Thank you for visiting. URL of this page "http://users.aol.com/kensrobots/kensrobots.html" or "http://kensrobots.com"